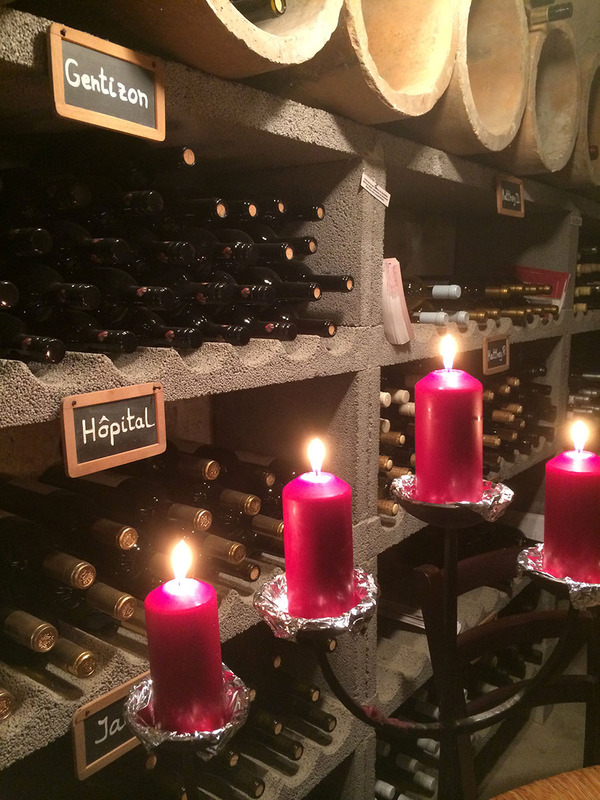 There are many wonderful things about wine, not least of which it allows you to keep falling in love! Occasional bouts of jealousy among the lovers is completely manageable, happily. Yesterday I fell in love yet again, this time with the Swiss region of Vully and in particular with the village of Môtier, which must be one of the most charming little corners of this little country. 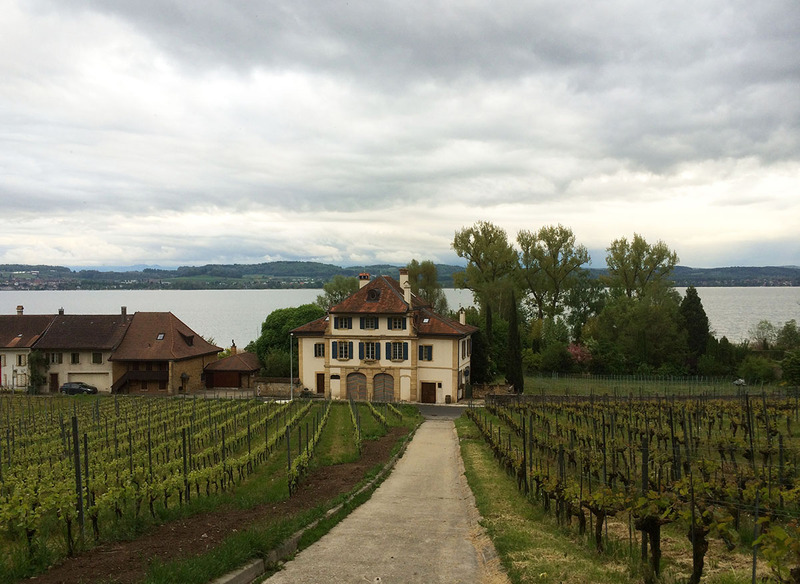 Entering Môtier, one of the charming villages in the Vully region that sits between lakes Neuchatel and Morat. I took the photo on the left at the end of the day, about 20:00, in the rain, but despite grayness and ebbing light it was a still lovely place to be. I climbed this little path at the southern entrance to Môtier thinking I would get a photo of the white tents on the opposite side of Lake Morat, the small lake that adds character to the town. One of Charles the Bold’s battles is about to be reenacted near the fine Medieval town of Murten/Morat and the tents mark the battle scene. At the top of this little grape workers’ road I discovered a walking path that seemed to lead into the woods and up into the hillside where there are yet more vines above the woods. There is a bench, a magnificent small waterfall at the edge of the forest and a discreet door into the granite wall of the hillside where someone is surely storing wine. Magic! All this was fading into day’s end behind me as I took the photo. The vines you see here hold the lower part of the slope. The hillsides here seem to be made of steps of greenery; later, looking for information on Upper Vully (the northern end of the lake) I discovered that this is no accident – here are the wine producers’ instructions from the cantonal forestry service. The town of Môtier is beautiful and filled with very good winemakers. I was visiting one, the Petit Chateau – more on that in a separate post. The village gets busy with tourists and people sampling wine in summer. No wonder, with lakeside restaurants, hiking trails and of course, the wine. I ended up at a meeting 3-4 km away on the border, quite literally, between cantons Fribourg and Vaud. Vully, the region, is older than cantonal demarcations, and part of it sits in each canton. 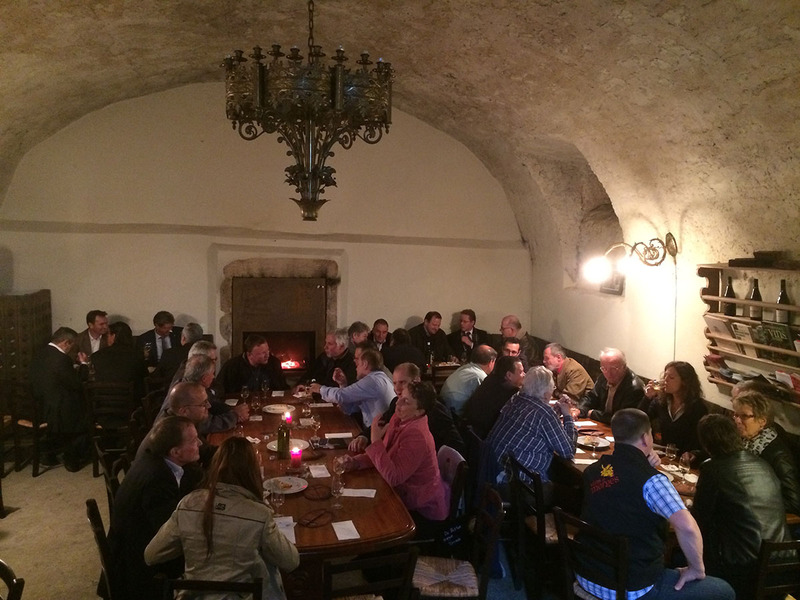 The Terravin meeting I attended was held at the Caveau de Vully, where several local wineries sell their wines. It is in the old customs house: at one point, you had to pay duty on your wine and everything else if you were shifting it between Fribourg and Vaud. Inching carefully down the very steep steps that lead to the cellar where groups often hold meetings felt very much like a step into the past. You sit down for a glass of wine; none of this modern mingling while standing. You have to hope you share at least one language with your table neighbours. A glass of the best local Chasselas and a slice of Vully “cake” (thick soft crust with cheese and bacon and caraway seeds) are set in front of you, and the urge to discuss wine and politics and the world at large takes over.